Spent the day visiting graves of long ago relatives. 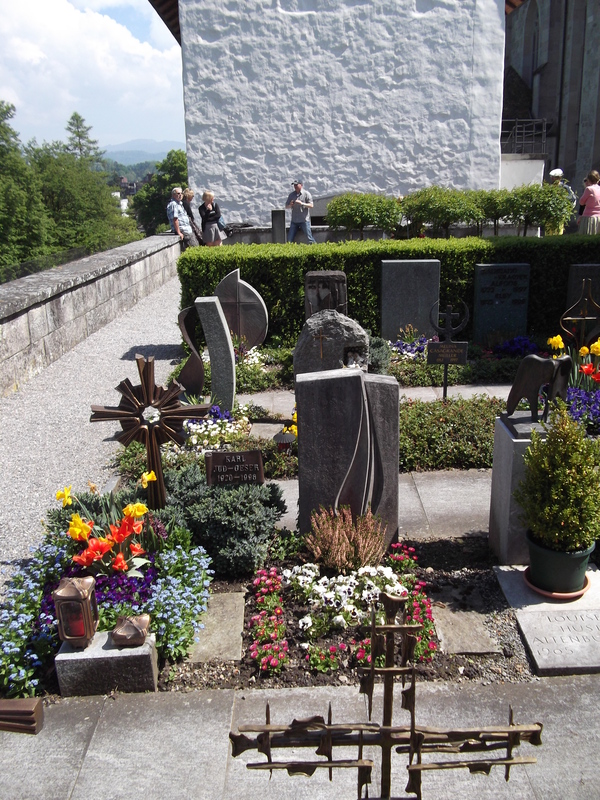 Fascinating measure of cultural identity, graveyards. The British graveyard is, at times, completely forgotten and in disrepair. Given the age of the graveyard it is not at all surprising as the relatives that buried their kin are now long dead too. 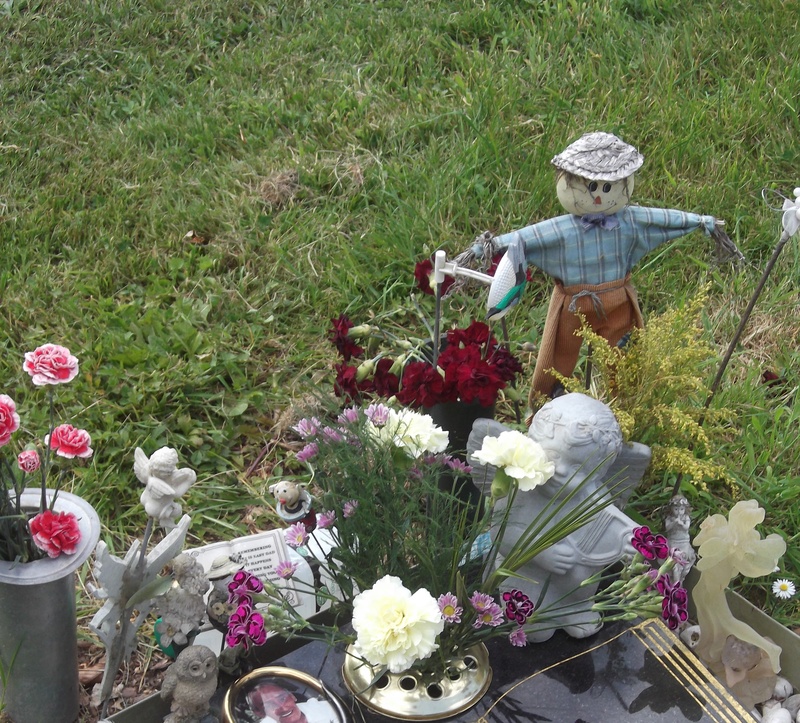 However the most recent graves have this fascinating cultural quirk of adding garden gnomes, giant plastic bees, scarecrows, lanterns and other paraphernalia along with the requisite flowers and religious statuettes. In my minimalist mind, I find this over the top. However it is a clear indication of love and care and affection for the departed person. As such who am I to question it. I do, however, find it a curiousity. It seems a recent thing (ie last 20 years or so) and, in the same way that a hundred years ago graveyards were defined by fields of gray slate, so will today be defined by accessories. Bit of a difference, really. 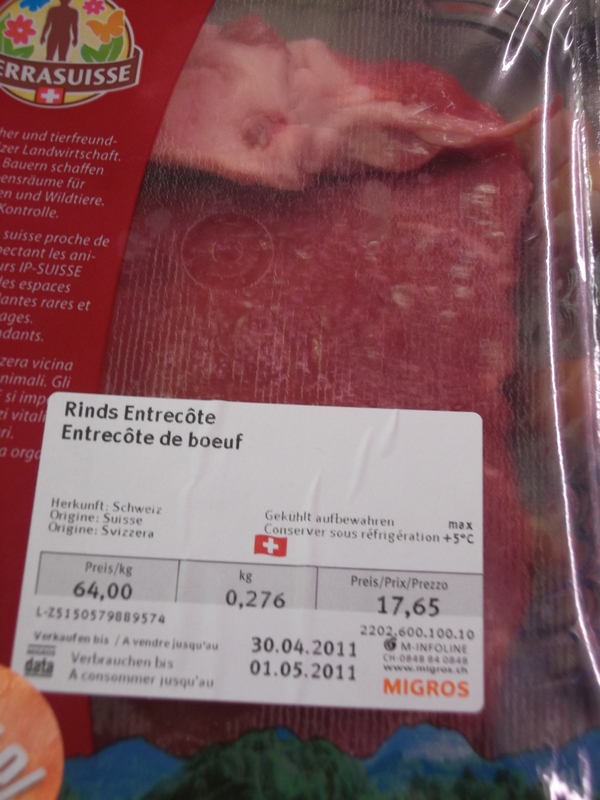 To be honest, I prefer the Swiss version. I just couldn’t afford to be buried there, I’m guessing. Ok this might be long. There were sooooooooooooo many quirks to observe. I’ve mentioned the price of things. It remains insane. And you know how the Swiss are famous for their cuckoo clocks and watches. This is 4o thousand less than my house. The driving here is mental. Not just because they drive on the wrong side of the road but because, to be fair, I suspect the Swiss attitude is kind of tightly wound. There appears to be a mindset here of embattlement, possibly because they are the only country not to embrace the European Union yet. My family describes it as having a Swiss moment. Have you heard of the Gnomes Of Zürich? Does that not sound completely charming. Sadly no. The Gnomes of Zürich was a term coined by British Labor Party politician Harold Wilson in regards to the Swiss bankers. The name has stuck. Fascinatingly the Gnomes come out for an hour between 1130 and 1230. 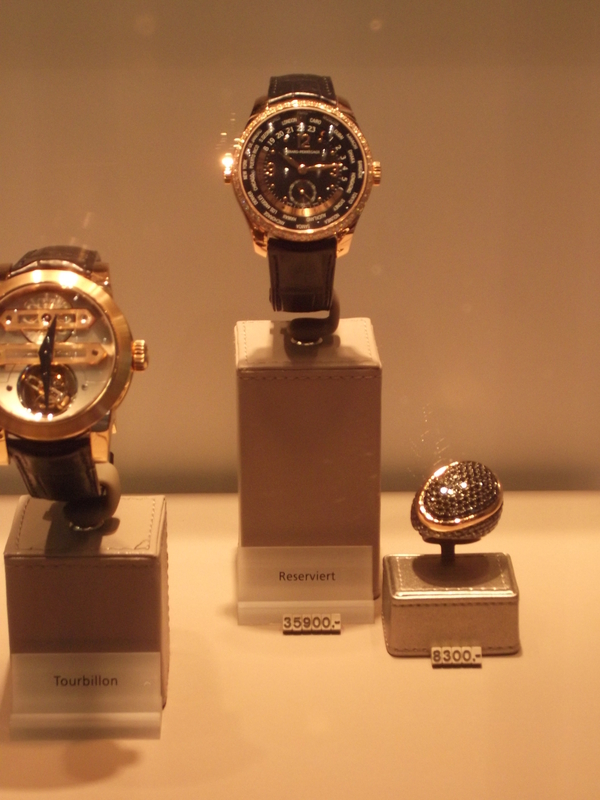 We walked through the streets of Zürich at that time and the place was hopping. Loads of people in suits. Then the clock struck at 1230 and they disappeared. Like Gnomes. Speaking of lunch time evidently you never have lunch in Switzerland at 12. All the Swiss seem to have their lunch then. There is no other time. Evidently it’s like eating time at the zoo. I didn’t experience it at that time but I can attest that eating at 1 was like having dinner in a ghost town. 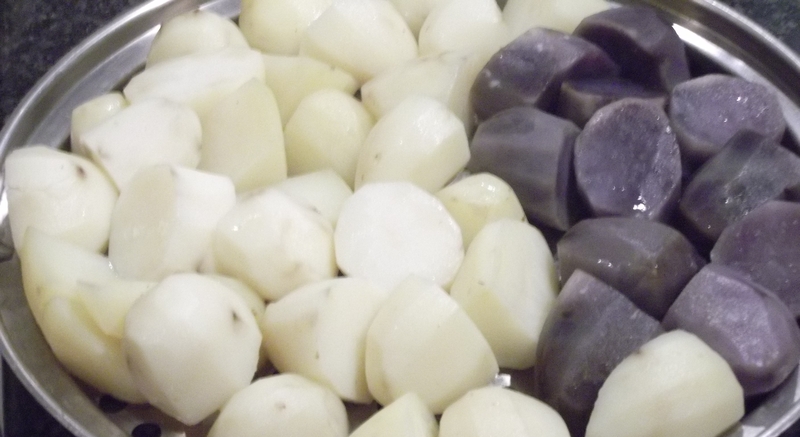 They have purple potatoes here. Evidently they are purple cos they are full of anthocyanin, which is good for memory and preventing cancer, evidently. They taste just like white potatoes. It’s like eating martian food. You will never not know your time here. There are clock towers on almost every street corner. On the other corners are churches. With bell towers. Bell song is constantly heard, this is very pretty except in the middle of the night. Between that and the clock towers there is 24/7 noise. Which can get annoying to be fair. No wonder they desensitize themselves with cuckoo clocks. Dragged from the archives as my post about last night in Charlotte alone still hurts to read. Maybe one day. One from the vaults, pardon the pun. I am busy in Charlotte and don’t have time to scratch myself yet. Will write more soon. Here’s one from the cupboards till I can catch my breath. I am cautious about calling the blog The Wacky anything. Last time I did that I started war with the French. However the Swiss are just blog gold. You turn your head and there is something else quirky to comment on. So today’s discovery. They all have bomb shelters here. That is just seriously awesome. Everyone here has to have a bomb shelter in their house or access to one. Despite being neutral the country is armed to the teeth and has a system of secret tunnels in their mountains for their defence. And there are bomb shelters aplenty here. The room is underground and the concrete walls are, at least, a foot thick. The door you see there is massive and incredibly heavy. You literally heave to move it. 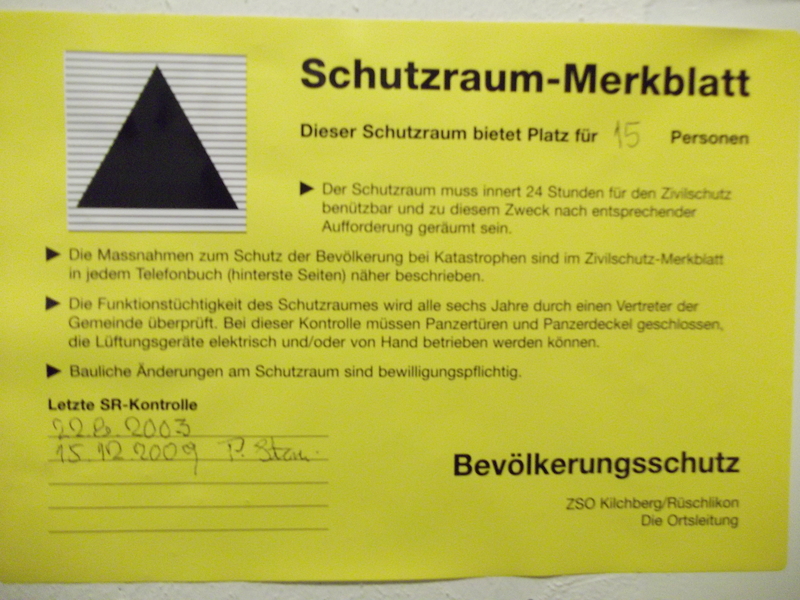 They use this room (rooms actually as this complex has two) as a drying room for clothes. So, in addition to the air filtering system in the concrete bunker, there is a heating system to warm the air and dry the clothes on the clothes lines that stretches across the rooms. This is the cheery warning on the door. The gist of it is the shelter would house 15 people (though God knows how – it wasnt that big) and it helpfully describes that the pamphlet of the measures to protect that population are available in the phone book, or some such. Which is something I always want to know when I open the phone book. And I love the concept that you can dry your clothes while you sit out the apocalypse. They have thought of everything. I love vending machines. It’s the only place you can get a sample of a country’s sweets in one easy access, push button window. It’s like a barometer of the country. Australia has a mixture of health and sweetness, the machine will be filled with an equal amount of chocolate and health bars (which are as bad as the sweets but you can feel virtuous.) America is all about the candy. Nothing healthy there and mostly peanut butter chocolate which is fine by me. Very fine by me. The UK is all about the candy but also the health. Almost always the candy vending machine and the health vending machine are next to each other. 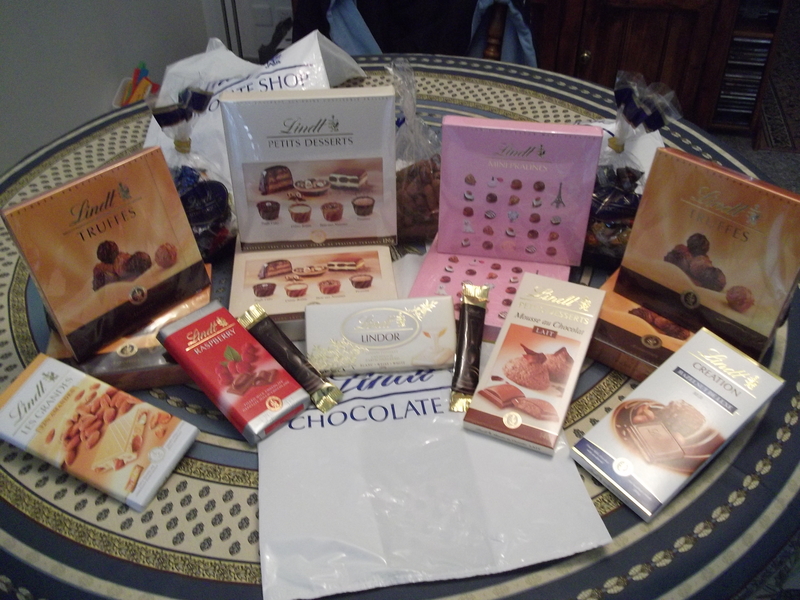 And Switzerland is all about the candy. And the babies. 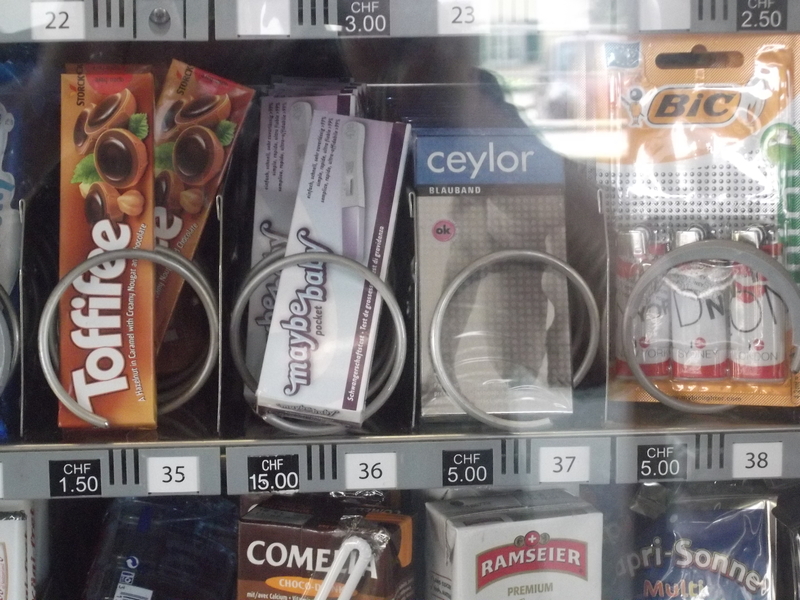 Oh yes, presenting the vending machine that gives you condoms and pregnancy tests with your milk chocolate. 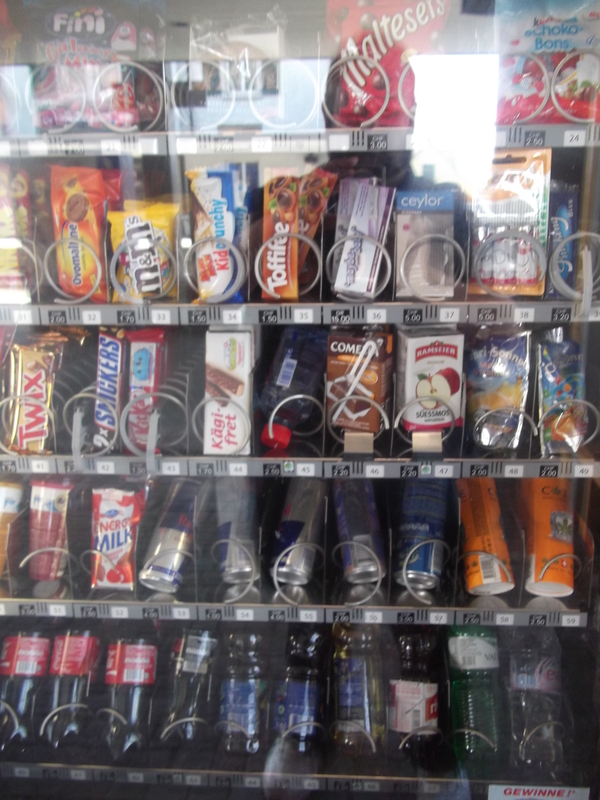 You can imagine the post coital Swiss going to the machine for some much-needed glucose after all their exercise and thinking wow, lets test for that baby cos we should have come here first and got some condoms. There were even lighters to light their cigarettes. The Swiss think of everything. Also for sale in the vending machines is this delightful item. Obviously I tried this. It tasted like Iced Tea but slightly bitter. No buzz to speak of which was incredibly disappointing. I tried seven and still no buzz. Joke. Or is it? 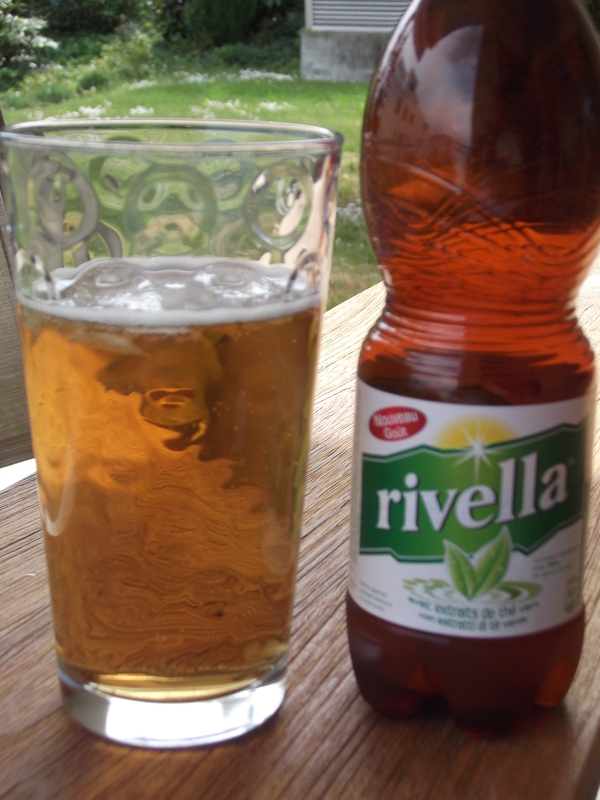 It actually tasted better than this drink, which is THE drink of Switzerland. This is a carbonated drink made from milk whey which reflects the Swiss obsession with cows. Obviously the first thing you do with milk is make fizzy drinks with it. The family think it is disgusting however I didn’t think it was that bad. 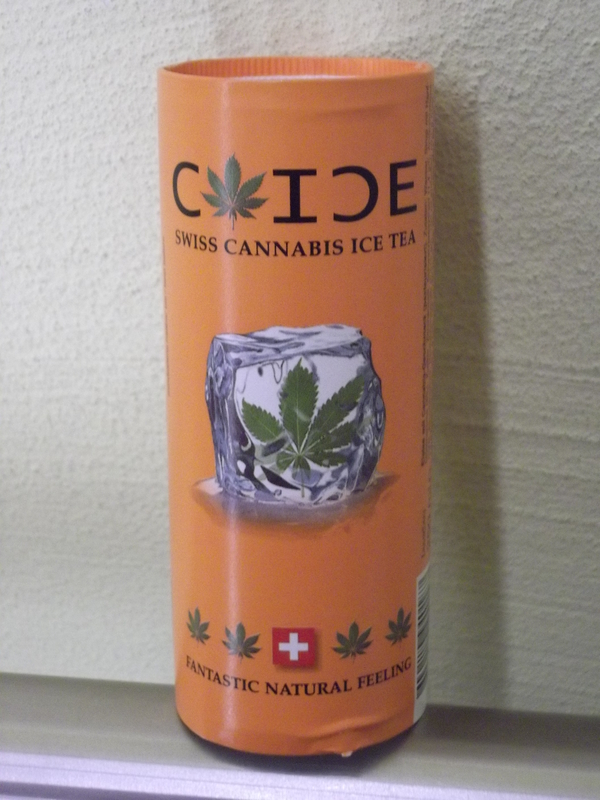 Just the marijuana ice tea was nicer. It is, however, a fizzy milk drink. It is the most popular drink here. Which just goes to show what a wacky bunch of people the Swiss are. Oh, do I have stories…. *Not you KB. You get extra special presents for being the only one who still comments regularly. Well firstly there is this. Loving the scenery here and the history of the architecture here is astounding. It’s also delightful with the chalets on the sides of mountains. Very heidi -esque. Beautiful. Man it is dear here. Evidently the tax here is quite small and the wages here are quite high. For example, the waitress serving us last night earns roughly 80,000 a year. That sounds wonderful but the meal of some sushi cost 118 dollars. Eek. Using an even more extreme example, a Big Mac small value meal (A Mac, small fries and coke) costs 11 Franks. For the British people in the room, that’s 7 pounds. For the Australians, that’s $11.50. For the Americans, that’s $12.70. So it’s a lovely place to visit but, really, you need to get a second mortgage to do so. For example, here’s some steak. A mere snip at 64 franks a kilogram. Further quirkiness. We went to see Thor in 3D last night. I thought it would be more expensive but sadly, Australia, we’re paying the same amount for a 3D film. This was fine and I was, to my surprise, enjoying myself. Then halfway through the film, the lights come up and the film stops. Intermission. They have intermission here which is incredibly sweet. And annoying. However they don’t care where they stop the film. Whatever is halfway, there goes the lights. In Thor, it was in a boring scene of dialogue however that was pure fluke. I can imagine them doing it through pivotal fight scenes or expository scenes and, of course, when it comes back the movie has progressed. Fantastic! The sad thing, of course, is that it works. Everyone got candy. I didn’t. I had a point to prove. The completely genius thing about Switzerland is it is in Europe and Europe is both amazing and incredibly easy to access. A car and a bit of patience and you can visit any country. And each country has their own history and architecture and beauty and culture. Within walking distance in some cases. Or, as we did today, a 2 hour drive and we’re in Italy. And today we visited Como. 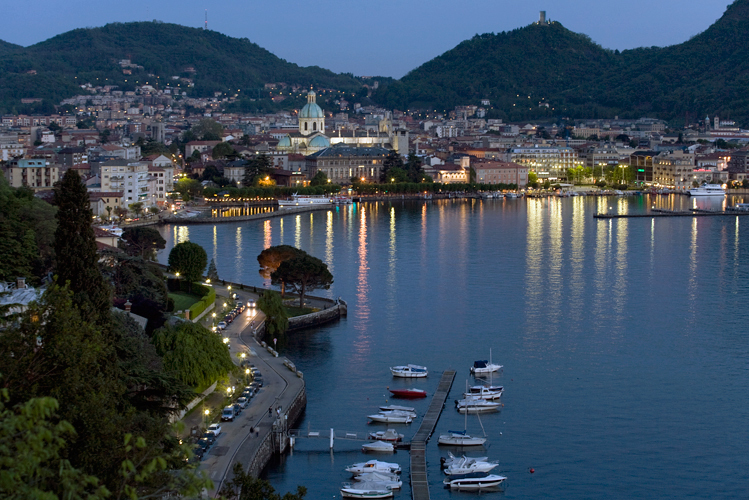 Como is a city in Lombardy, Italy and is located around the gorgeous Lake Como. So as you walk the city, the villas surrounding the lake reflect in the water. It’s beautiful. And after the shock of Swiss prices it was nice to shop in an area that didn’t require selling your first-born. We had dinner there without needing to sell one of my nephews. The driving is insane though, both there and in Switzerland. We were hit from behind while waiting at the road crossing. (All fine, minimum damage, realllllllllllly loud crash though) and we were almost side swiped in a really scary intersection. Spooky. And I had this completely blonde moment as I was walking through the streets. There were loads of pizza places. I was amazed. Seriously. Then the penny dropped. Mensa have requested their card back.